Volvo is very serious about launching a hybrid range of trucks as they celebrate premiere of the FE Hybrid in Europe. Following a series of comprehensive field tests limited series production of approximately 100 hybrid trucks is now underway and deliveries are expected to commence in selected markets in Europe will occur from 2011 to 2013. The Volvo FE Hybrid will initially be delivered to 13 European countries, and sales may be extended to additional markets in the longer term. The Volvo FE Hybrid is a parallel hybrid, which means that energy from the diesel engine and electric motor can be utilised either together or independently of one another. The system switches automatically between the two power sources. When the hybrid is driven in first gear, the vehicle is powered solely by its electric motor, giving the driver alert throttle response and thus excellent driveability. Then, when the hybrid mode kicks in, the diesel engine and the electric motor will work in parallel to optimise fuel savings. The new quieter and cleaner hybrid trucks offer fuel savings of up to 30 per cent and will primarily be used in distribution and refuse operations in urban environments. The trucks will be manufactured in limited series production because the advanced hybrid technology requires customised production solutions. Battery technology is also constantly evolving. This means that the company’s after sales organisation must be trained in parallel to provide the right service to customers. “Our new Volvo FE Hybrid is a fantastic high-tech truck, which has already created a large amount of interest. It’s clear that there is a great demand for heavy hybrids,” says Claes Nilsson, President of Volvo Trucks’ Europe Division. “The fact that we are starting production of hybrids now is tremendously inspiring and important for future product development since some form of hybrid technology will exist in most trucks in the future. Hybridization is definitely an important piece of the puzzle for more fuel efficient transport,” says Claes Nilsson. Mercedes Benz offers ML450 HYBRID in the U.S.
Now that BMW is unveiling the hybrid version of its X6 model, Mercedes Benz is also playing the ball by announcing the ML450 Hybrid 4Matic for the American market. The ML450 HYBRID joins the S400 HYBRID and our BlueTEC diesel models in our portfolio of fuel-efficient and environmentally compatible vehicles and will be offered as part of a special lease only option (no purchase) for a monthly lease price of $659 per month for 36 months and $549 per month for 60 months. ML’s hybrid powertrain consists of a 3.5 liter gasoline V6 engine which is optimized via the Atkinson cycle and delivers 275 hp, plus two electric motors which develop 80 hp and 192 lb.-ft of torque and 83 hp and 173 lb.-ft of torque. So the car has a combined power of 335 hp and 381 lb.-ft. of torque, which is the same sort of power you get from a 550 V8 engine but with 46 percent better fuel economy. The car manages 21 miles per gallon around town and 24 mpg on the highway. BMW has introduced a new model from its ActiveHybrid series which is based on the X6, and it’s one of the finest examples of hybrid 4x4s ever built. The hybrid powertrain of the X6 consists of a regular V8 engine and two electric motors which are fed by Li-Io batteries installed in the rear compartment. So it manages to be powerful and economical at the same time. Considering its capabilities, this car delivers great values. The main source of power is a 4.4 liter twin-turbo V8 engine with 300 kW/407 hp, it is mated to two electric motors developing 67 kW/91 hp and, respectively, 63 kW/86 hp, so the system chucks out a combined power of 357 kW/485 hp and peak torque of 780 Newton-metres/575 lb-ft. This make the BMW ActiveHybrid X6 the most powerful hybrid vehicle in the world. Over and above the electric motors, the high-performance battery also supplies electrical energy to the power-consuming items linked to the 12-volt on-board network. The BMW ActiveHybrid X6 is equipped with electromechanical power steering and an electrical climate compressor both remaining fully functional also when the combustion engine is switched off and enhancing the overall efficiency of the vehicle to an even higher standard through their on-demand consumption and uptake of energy. As for the performance and fuel economy, the X6 AH delivers great numbers for both! It takes the car only 5.6 seconds to reach 100km/h from stand still, while the average fuel consumption is fairly low at 9.9 litres/100 km (equivalent to 28.5 mpg imp), the CO2 emission rating is 231 grams/kilometre. There are certain car makers that people turn to when looking for certain traits and specifics in a new car. When car buyers look for reliability and performance, as well as good gas mileage, they often turn to Toyota. Toyota has been in business in one form or another for more than seventy years, and for the last thirty or more have developed a lasting reputation as a fine maker of economical automobiles that perform well and last a great deal of time. The company has also been successful at recognizing and staying ahead of trends, always willing to change their car making strategy in order to give car buyers what they really want. This was true in the 1970s when they were the first to market small pickup trucks, in the early 1980s when they turned their attention to fuel efficient economy cars as well as the 1990s when they moved into the luxury and high end performance vehicle marketplace. Toyota is at the forefront of automobile technology again, being one of the first and best automobile manufacturers to build and sell hybrid vehicles. Building on the amazing success of the Toyota Prius hybrid car, Toyota has undertaken the large task of creating a hybrid SUV that still exhibits all the traits of a Toyota vehicle that customers have come to count on over the years. 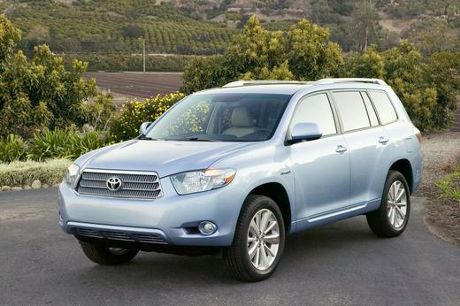 Their attempt at just such a vehicle is available, and it goes by the name of the Toyota Highlander Hybrid. The Highlander Hybrid was first introduced in 2006, but not widely marketed until 2008, and was received rather well by the car buying public. The 2009 model is again a four-door SUV with room for up to seven passengers. Good gas mileage for an SUV is achievable in the Highlander Hybrid with the 3.3 liter, V-6 hybrid engine normally achieving 25-29 miles per gallon depending on driving conditions. While the vehicle doesn’t achieve the amazing gas mileage of many alternative fuel powered vehicles, it does quite well for a sport utility vehicle. The interior of the Highlander Hybrid is up to par in terms of the kind of ride and comfort that Toyota has become known for. Most drivers of the vehicle rave about the roominess of the interior, especially in terms of leg room for the driver. The Highlander Hybrid is perfectly made to haul both adults or children on everything from a business trip to a multi-day driving vacation. The front bucket seats are designed to fit a driver and passenger of any size and are adjustable in a number of different directions. The driver will love the on board trip computer that comes standard on the Highlander Hybrid as it displays not only the average speed and average fuel consumption, but also approximately how many miles the vehicle has to go before it needs to be refueled and a great deal of other information. It also comes with a six speaker AM/FM Radio with CD/MP3 capable stereo system standard in all models. Safety was a big concern with the Highlander Hybrid, and Toyota’s engineers spared nothing on designing an overly safe vehicle. Along with a large number of airbags designed to protect everyone in the vehicle regardless of where they are seated, the Highlander comes with side guard door beams, a rear facing video camera and three point seatbelts for passengers sitting in either the front or rear of the vehicle. As far as extra options that a buyer can add on to their Highlander Hybrid, Toyota has come up with a number of them too. For those looking at climate control options, there are front dual zone automatic climate control and both manual and automatic rear air conditioner options available. There is also an option available for a factory installed vehicle anti-theft alarm and immobilizer for those concerned about protecting their new vehicle. A number of other first class options are available in different packages as well. Overall, anyone looking to take the step to a hybrid vehicle who doesn’t want to leave the comfort and size of a sport utility vehicle behind would be well served in jumping behind the wheel of a Highlander Hybrid. When considering comfort, available space for people and cargo, fuel efficiency, environmental impact, not to mention the overall look and feel of an SUV, a car buyer simply can’t go wrong if they are looking at purchasing the 2009 Toyota Highlander Hybrid. The vehicle simply offers everything anyone wants from an SUV, plus the added bonuses and benefits of a reliable Toyota built automobile and modern hybrid technology.